As those who know me are probably aware, in July, we left Beirut, Lebanon and moved to Skibbereen, Ireland, my wife’s hometown. We’ve spent the last couple of months settling in, and I’ve been looking for a position that will be a good fit. One item in the “settling in” checklist is the joyful process of setting up my home network. I was able to bring all of my data with me, but, with my background in system administration, making sure that data is safe is very important to me. I’ve set up RAID1 on my media center that doubles as a datastore, and I’ve just finished assembling a Raspberry Pi with an external hard drive as my backup. Once we have decent internet (dependent on us knowing where we’ll live for the next while which is dependent on me knowing where I’ll be working), I’ll also be setting up something on the cloud, most likely with Amazon Glacier. But the story of bringing the media center computer to Ireland is the one that I would like to share, especially as it wasn’t as straightforward as you might think. In Lebanon, I had a media center in the living room, connected to a TV and a nice 5.1 surround sound system. We didn’t watch much TV, but we did like listening to music and having our photos on a random slideshow was a great way of keeping our kids aware of distant family. When it came time to leave Lebanon, I had originally planned to just bring the hard drives and buy a new desktop. But when it came time to pack, we had extra luggage space, so I changed my mind and decided to bring the motherboard, RAM, graphics card, etc. The question was, how am I going to keep all that safe? If only there was some box designed to protect a computer’s internals! I decided to just bring the computer case. Granted, it was old, large and heavy, but Qatar airways was giving us 30 kg (66 lbs) per bag, so we had the space. This is the point where I had my epiphany. I consider myself an expert on packing. I’ve spent all of my adult life traveling between Lebanon, the US and Ireland, and I have become quite skilled at getting our belongings from one place to the other without damage. 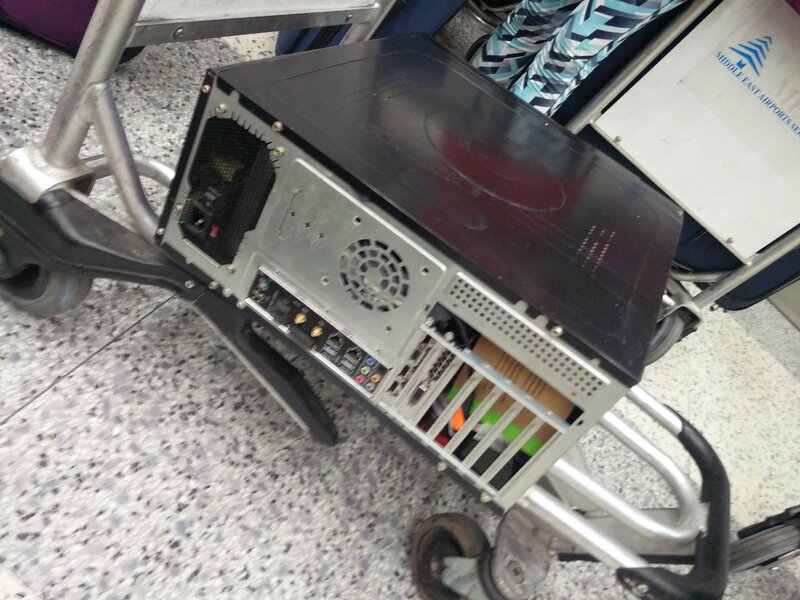 So, as I was looking at the computer case, it hit me that it’s made out of metal and would be able to withstand the attention of the most careless baggage handler. Why not put all of our fragile goods in it? If I padded it with enough clothing, everything would be snug as a bug! I gave myself a pat on the back for such a brilliant idea and proceeded to fill the case with ceramic bowls, a Starbucks gift mug, my Wii remotes, and various other technology, with plenty of socks and underwear to keep things from rattling around. Then, not wanting anything to fall out the side, I screwed the side cover on. With both screws. And tossed the screwdriver in a different bag. I showed off my ingenious packing job to my wife, expounding on the fact that her precious bowls were safe in the bowels of the computer case. She rolled her eyes at me (a common occurrence when I share my brilliant ideas with her), and I went off to wrap the case in a blanket and put it in our lightest piece of luggage, a large duffel bag filled with lots of clothing. Now one or two readers may be leaning back in their chairs, astounded at my brilliance, but I suspect that the majority will have spotted the teensy-weensy little flaw in my cunning plan. I am ashamed to admit that I didn’t spot it until we were actually in the airport. Beirut’s Rafic Hariri International Airport differs from most in that you clear your first security check before checking in. It was only as we were in the queue that it suddenly occurred to me that airport security might be somewhat unimpressed with my irregular packing scheme. As I watched the duffel bag go through the scanner, the guy at the machine sat up and looked at me. “What do you have in the bag?” he asked. “I think it’s one of my wife’s ceramic bowls,” I answered. The security guy at the front of the x-ray machine walked around to look at the screen, and there was an animated discussion as both pointed and debated what they should do. One was of the opinion that only an idiot would try to smuggle something out of the country in a computer case, while the other pointed out (quite rightly) that only an idiot would pack a ceramic bowl in a computer case. The suspicious security guy then came over to me and asked for my passport. He escorted us to the check-in desks, told my wife and kids to wait there, and escorted me and the computer to the other side of the airport where there was another security checkpoint, and, more importantly, his boss. “Can you please open the case?” the boss asked, in that calm tone that professional soldiers use just before beating you to a pulp and tossing you into deepest corner of Gitmo. “Um, I don’t have my screwdriver. I’m sorry,” I answered sheepishly. He looked at me steadily, said “Ok,” and then wandered away, presumably to find a screwdriver. As I waited for him to return, I started fiddling with the screws. I managed to unscrew the first with my fingers, but couldn’t get the second one undone. One of the security guys saw what I was doing, and, to my lasting astonishment, handed me a sharp-tipped knife. Granted, it was just a dinner knife, but still… I used the knife to unscrew the final screw and handed the knife back to the security guy. He called the boss back over (he still hadn’t found a screwdriver), and I started to open the case for him. “Stand back! Don’t touch it!” he ordered. I stepped back as five security guys surrounded my computer and started to pull out and examine each item. The socks and underwear used as padding went flying everywhere. It was obvious that these guys had decided that I was a smuggler and they were going to catch me! One guy pulled out a ceramic bowl and held it up to the light, checking for who knows what. Another opened up my Wii remotes, pulled the batteries out of them and checked for anything that shouldn’t be there. A third tried to pull the graphics card out of the computer case, and, when it wouldn’t come, used the flashlight on his phone to see if anything was hidden in the GPU fan. I watched as the fourth pulled out a souvenir Starbucks mug, removed it from the box, examined the box in detail, checked the mug for hidden compartments, and then put the mug back in the box. The fifth guy then picked up the Starbucks mug and repeated the examination, just in case the fourth guy had missed something. When it became obvious that I wasn’t trying to smuggle anything illegal out of the country, the security guys gradually drifted away in disappointment. I was left with one guy who handed me my passport, told me to pack my computer back up, and then stood back and watched as I tried to fit everything back into the case. I took my computer back to my family at the check-in desk, packed it into the duffel bag, and checked it to Ireland. When we picked it up in Dublin, everything in the case had survived the journey, and the computer worked perfectly. I still don’t know if using a computer case as a suitcase was a very good idea or a very bad one. Original article title: Jonathan Dieter: How (not) to pack smart. This full article can be read at: Jonathan Dieter: How (not) to pack smart.